… saying no to a night of partying with friends so that you can prepare for a big interview the next day. … declining an offer to eat the last slice of pizza to stay true to your weight-loss regime. … overcoming the temptation to speak to an attractive stranger because you want to stay faithful to your partner. … deciding not to buy that expensive dress so that you can save money to buy your dream home. All of these are examples of typical incidents where self-control may be required on our part. The formal definition of self-control is one’s ability to manage one’s emotions and desires, particularly in tempting or challenging circumstances. It’s about the discernment we demonstrate when distinguishing between a need and a want. It is our propensity to sacrifice short-term pleasure for long-term gain. Most human beings are basically intelligent and well-informed individuals, especially in this digital information age where we have information that is available to us at our finger tips. Yet no matter how much knowledge we absorb about what’s good for us and what isn’t, we often find it difficult to apply it with success. It is during our moments of weakness that we give in to the allure of instant gratification. I like to imagine that during those decision points, a little angel stands on one side of us and a little devil on the other side, arguing about which course of action we should take. Getting stuck in this state of indecision can be downright frustrating as we struggle to do the right thing. For most people, their emotional side ultimately overrules their rational thought process and it gets to veto the decision. The emotional facet of our thinking houses the little kid within all of us who just wants what it wants, without considering the potential consequences. Sometimes, listening to this kid can be liberating and therapeutic for us. After all, we can’t always be all buttoned up and serious about how we conduct ourselves. It is healthy to occasionally let our hair down and indulge in the pleasures of life. Yet there are times when we should rein in control over our circumstances. Our inner kid does need to be disciplined in the event that he/she throws tantrums or desires to engage in possible harmful endeavors. It is during those times that we need to draw the line, remind ourselves of our constraints, and be judicious about how we spend our time, energy and other limited resources. A significant part of the maturation process of becoming an adult involves learning how to live a life of balance and moderation. When we cultivate our ability to discipline ourselves and make any needed sacrifices in our efforts to succeed, we will be well ahead of the majority of individuals in the world. In fact, several studies have proven that it is amongst the most essential traits for achieving greatness. The famous marshmallow experiment conducted by Stanford professors in the 1960s was one of the first findings to support this notion. During the experiment, a child was offered a choice between one small reward provided immediately or two small rewards if they waited for a short period, during which the tester left the room and returned later. The scientists surreptitiously took note of how the children reacted in their absence. In a follow-up study, research found that the kids who were able to wait longer for the bigger rewards tended to have more favorable life outcomes, which included better SAT scores, higher incomes and healthier body mass indexes (BMI). This experiment demonstrates how the foresight and maturity that comes with having self-control led to the positive results that the kids experienced later on in their lives. Delayed gratification is a life skill better learned when taught to children in their early years by parents or care-takers. It is at that young and impressionable age when our minds are like sponges, capable of absorbing almost anything modeled around us. For those of us who did not receive this form of guidance, we can still inculcate this trait within ourselves with persistence and steady awareness. Get clarity on what exactly you would like to change: In the initial stages of making changes in your behavior patterns, it is essential that you get clear on which areas of your life you would like to enforce more self-control. For example, would you like to spend less time on social media so that you can use that time to work on your own projects instead? Do you want to eat more vegetables and fruits while laying off the candy and chips? Write down exactly what it is that you would like to shift, and make an inner commitment to reform your way of being. Observe your patterns: A big part of the solution is largely based on the accuracy of our observations and assessment of our behavior patterns. I recommend carrying a small personal journal with you (or your smart phone) to note down whatever you notice about the specific behavior you want to change during the course of your days. Remember to have plenty of self-compassion during this reflective process and avoiding berating yourself with negative self-talk if you see something you don’t like. Learn more about your issue: Once you are familiar with your unique patterns, the next step is to seek out relevant and useful information about what you are experiencing. There are multiple ways to do this, such as doing a Google search, reading forums, and speaking with experts who can give you qualified advice. The objective of doing comprehensive research is to saturate your mind with all the tips, tools and facts that you can get so that you’ll steadily grow closer towards finding solutions. Find alternative behavior patterns: After creating a shift in your thoughts, you will need to proceed to the next crucial step, which is to alter the actual behavior. One way to do it is by finding a similar replacement that can substitute the behavior. When it comes to making long-lasting a paradigm shift in our behavior, substituting with healthier alternatives seems to be much more effective than quitting cold turkey. For example, if you are trying to wean yourself off eating creamy desserts and ice cream, a better alternative would be consuming other sweet, low-cal options such as frozen yogurt or sorbets. Modify your environment and create structure: Creating structure within our routines and environment is an absolute necessity if we are to succeed in altering our way of being. You need to be in an environment where you’re surrounded by people who support you in your attempts to shift your life. There are many creative ways to build an environment that is conducive towards your personal success. Some examples include keeping your laptop and TV out of your study room so that you can focus better on your work, stocking up your fridge with healthy snacks so that you can maintain a disciplined eating regimen, and leaving your credit cards at home when you go out shopping so you don’t spend too much. It is an interesting paradox that the more self-control we exercise, the more freedom we experience in life. Specifically, freedom from the irrational impulses that could lead you down an unwanted detour on your journey towards your dreams. 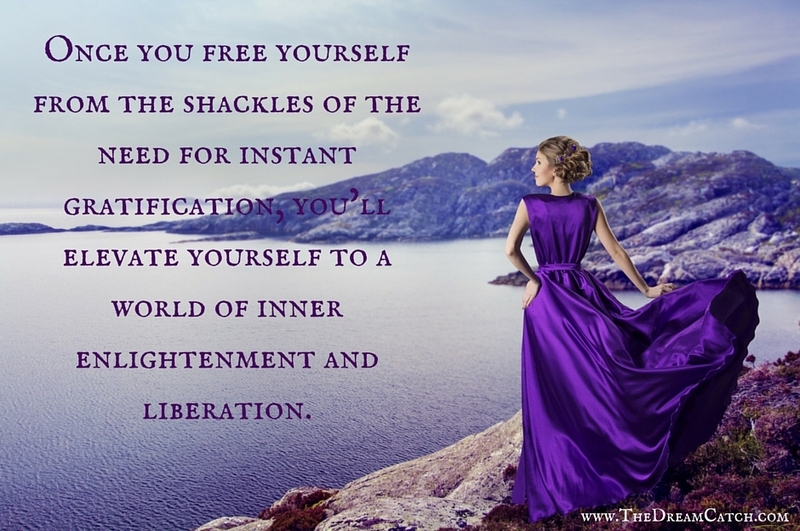 Once you free yourself from the shackles of the need for instant gratification, you’ll elevate yourself to a world of inner enlightenment and liberation. Question for you: What has been your biggest challenge when it comes to having self-control and what can you do to overcome it? Self-control is something many people struggle with in many different ways. Lack of self-control is not just binge eating but also poor oney management, shopping addictions, and many other good aspects of daily life that can become a problem when we have no self-control over them. Thank you for sharing this post with the rest of us! I agree Jennifer! 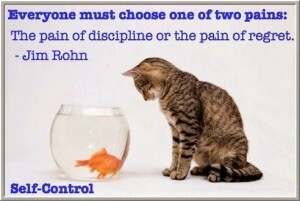 Everyone has something that they struggle with s far as self-control goes. It is an on going struggle and for some proplr it is the little things day to day and for others it is the big struggles of life that they wrestle with. Whatever the point is for us, we need to focus and be in charge and control! Exactly. It’s not always easy to do but we must strive towards it. Thanks for your comment Jennifer. Solid post! I mentioned the importance of having self-control multiple times on my blog and I still believe it’s one of the most important skills to have in life. Thanks Oskar! You have a some enlightening pieces on your blog too. All the best, Seline.